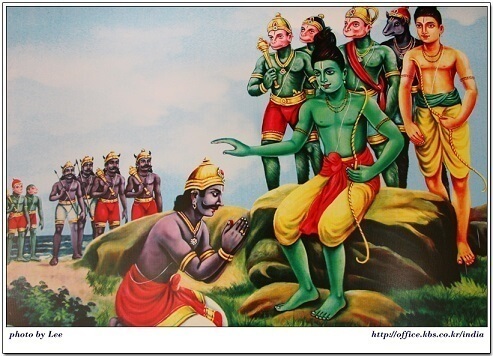 There are many characters who appears both in Ramayana and mahabharata. Here it the list of 12 such characters who appears in both Ramayana and Mahabharata. 1) Jambavanth: who was in Rama’s army wants to fight with Rama in Tretha yuga, fought with Krishna and asked Krishna to marry his daughter Jambhavathi. the king of bears in Ramayan, who plays a major role, during the building of the bridge, appears in the Mahabharat, technically speaking the Bhagavatam I would say. Apparently, during Ramayan, Lord Ram, was pleased with Jambavanth’s devotion and told him to ask for a boon. Jambavan being of slow understanding, wished for a duel with Lord Ram, which he granted, saying that it would be done in his next avatar. And that is the entire story of Symanthaka Mani, where Krishna goes in search of it, meets Jambavan, and they have a duel, before Jambavan finally recognizes the truth. 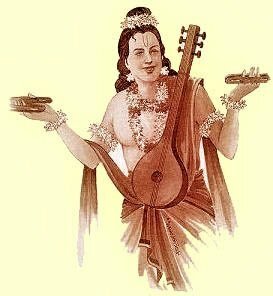 2) Maharishi Durvasa: who predicted the separation of Rama and Sita was the son of Maharishi Atri and Anasuya, visited the Pandavas in exile.. Durvasha gave a mantra to Kunti, the mother of eldest 3 Pandavas for getting children . 3) Narad Muni: Comes in many occasions in both stories. 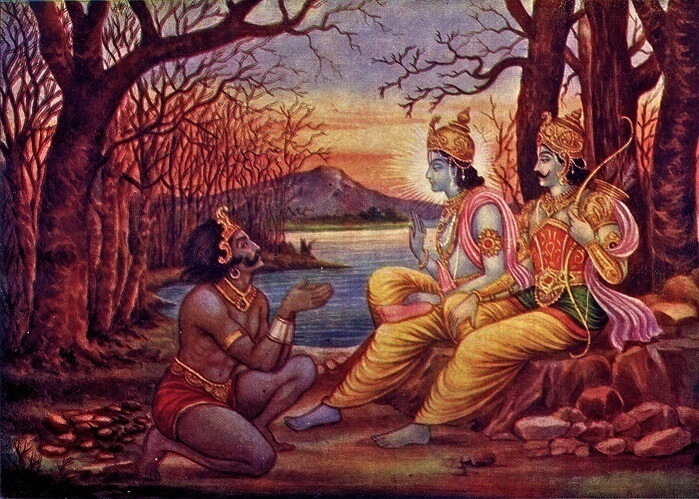 In Mahabharata he was one of the Rishis attended to Krishna’s peace talks in Hastinapur. 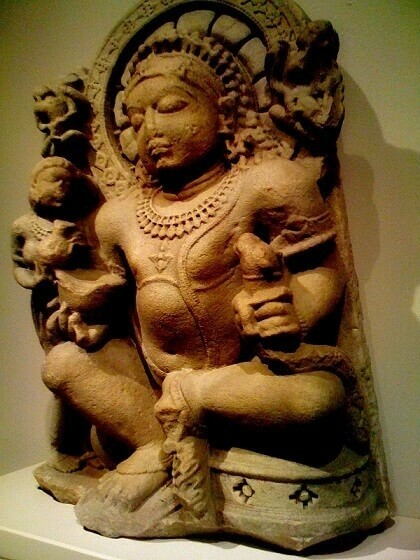 4) Vayu Dev: Vayu is father of both Hanuman and Bheema. 5) Vasishtha’s son Shakthi: had a son called Parasara and Parasara’s son was Veda Vyasa, who wrote the Mahabharata . 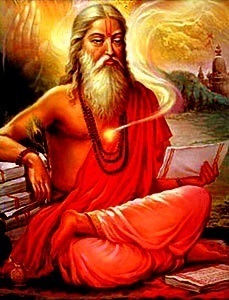 So this means Vasishtha was the great grandfather of Vyasa. 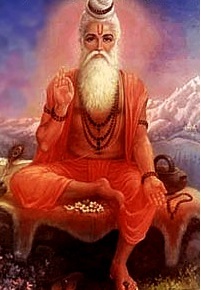 Brahmarshi Vasishtha lived from the time of Satyavrata Manu, to the time of Sri Rama. Sri Rama was Vasistha’s student. 6) Mayasura: the father of Mandodari and Ravan’s father in law, appears in the Mahabharat too, during the Khandava Dahana incident. 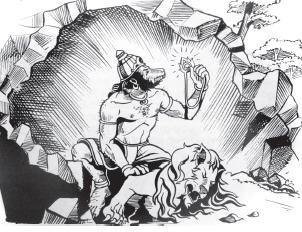 Mayasura was the only one to survive the burning of the Khandava forest, and when Krishna finds this out, he lifts his Sudarshan Chakra to kill him. Mayasura however rushes to Arjun, who gives him refuge and tells Krishna, that he is now sworn to protect him. And so as a deal, Mayasura, himself an architect, designs the entire Maya Sabha for the Pandavas. 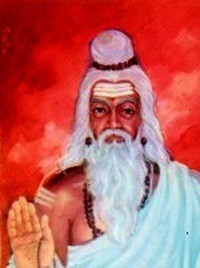 7) Maharishi Bharadwaja: Drona’s father was the Maharishi Bharadwaja, who was the pupil of Valmiki, who wrote Ramayana. 8) Kubera: Kubera, who is the elder half brother of Ravana, is also in Mahabharata. 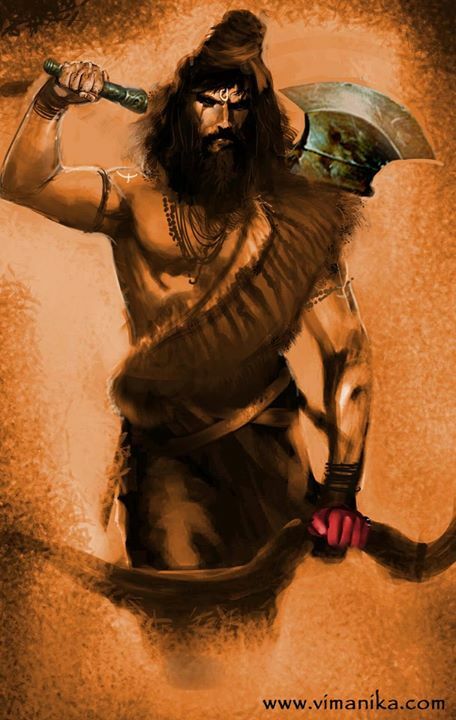 9) Parshuram: Parushuram, who appeared in Ram and Sita marriage, is also Guru to Bhishma and Karna. 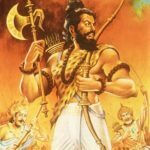 Parshuram was in the Ramayan, when he challenged Lord Ram to break the Vishnu Dhanush, which also in a way, quelled his anger. In the Mahabharat he initially has a duel with Bhishma, when Amba seeks his help in taking revenge, but loses to him. 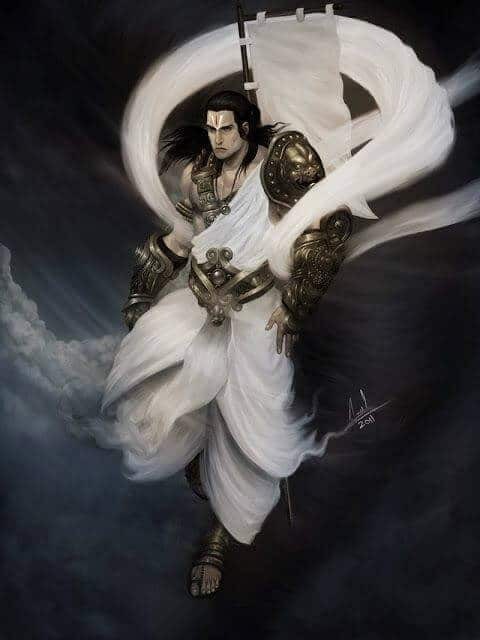 Karna later poses as a Brahmin in order to learn about weapons from Parashuram, before exposing himself, and being cursed by him, that his weapons would fail him when he needed them the most. 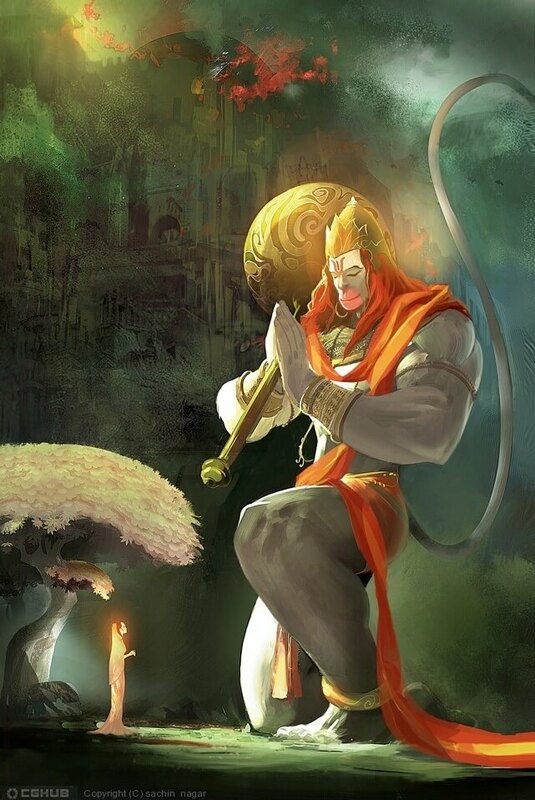 10) Hanuman: Hanuman being the Chiranjivi( blessed with eternal life), appears in the Mahabharat, he also happens to be Bhim’s brother, both of them son of Vayu. The tale of Hanuman quelling Bhim’s pride, by appearing as an old monkey, when he was on the journey to get the Kadamba flower. Also another tale in the Mahabharat, of Hanuman and Arjun having a bet of who was stronger, and Hanuman losing the wager thanks to help of Lord Krishna, due to which he appears on Arjun’s flag during the Kurukshetra war. 11) Vibheeshana: Mahabharata mentions that Vibheeshana sent Jewell and Gems to Yudhisthira’s Rajasuya sacrifice. That is the only mention about Vibheeshana in Mahabharata. Image credits to the Original artists and Google Images. The hindu FAQs does not own any Images. Its quite amazing to know that there are so many stories that many are not aware. This story is a perfect example. 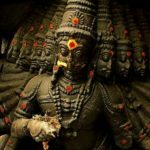 Hardly many are aware of the story when two avatars of Vishnu fought with each other.